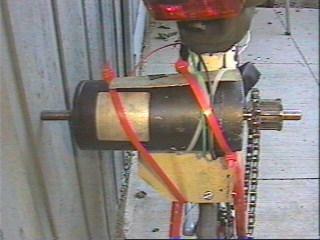 For Phase II testing I mounted the drive motor on my racing bike. Since I don't have a controller yet I only used 36V worth of batteries. With the drive ratio I am using I thought they would be able to get me up to around 28 mph. In the housing area where I live there is a stretch of road about 300 yds long between stoplights and it doesn't get much traffic. 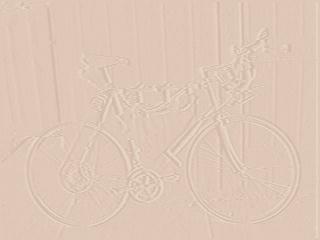 Unfortunately the little drive motor I'm using doesn't have enough power to get 300 lbs worth of me+bike up to 28 mph in less than 300 yds, the best I got was 22.5 mph before I had to shut down and apply the brakes :-) At that point I was drawing approx. 350 watts of power from the batteries. 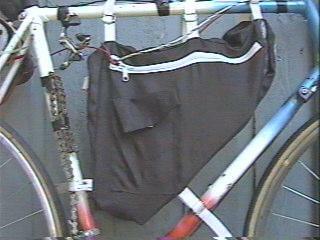 I use this frame mounted bag to hold the batteries. I'm using some Hawker Cyclon Monobloc batteries that I picked up at an electronics surplus store. You take your chances when buying surplus, I've had two cells fail so far. One of the cells failed during this phase of testing, fortunately I have a couple spares. The cell shorted during my second test run, just after I started out while the motor was drawing between 20 and 30 amps. This is my control panel, it doesn't look like much but it gets the job done. On the left is a multimeter used to measure pack voltage. In the center is an automotive Amp guage. The square box on the right is a 30 amp DC circuit breaker with a delay of 51 (51 what? I don't know). It kept slipping out of the tiewrap so I added the electrical tape during testing. On the handlebar you can see the bike computer (speed etc.) that was already mounted on the bike. I used 12 guage wire to hook everything together. 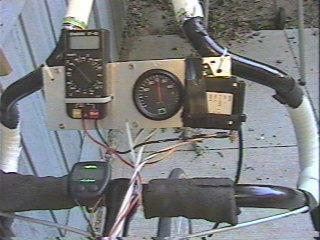 The current drawn by the motor was usually less than 20 amps, so this worked fine. Speaking of the motor...here it is. Since this isn't a permanent installation, the motor mount is...um...not exactly sturdy. I bolted the motor to a piece on metal, then bolted the plate to the rear brake mount. The tiewraps are supposed to hold the motor in place. 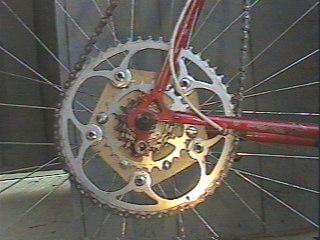 The more astute of you will notice that my drive sprocket looks alot like the body from a shimano 105 cassette freehub. 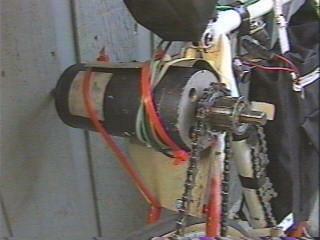 I couldn't find a drive sprocket that would fit both the chain and the drive shaft, so I built one. I took a timing belt pulley that fit the motor shaft and turned it down so that it would fit inside the freehub body. I turned it down by spinning it on the motor and taking a file to it. I then used JB Weld (a high temp, high strength epoxy) to hold it all together. 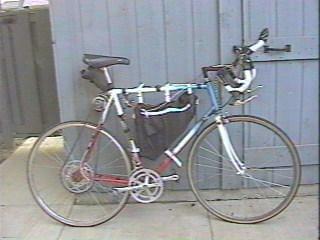 This bike is about 10 years old, last year I replaced all of the components in the drive chain. I solved this problem by turning the motor off before I hit the dip and then back on afterwards. The really big red tiewraps seen here were added when I tried running at 48 volts. Unfortunately 48 volts created the same problems as hitting a bump, when I would tighten them up enough to keep from derailing right at startup they would break at startup. I did manage to make one (1) run at 48 volts, I got up to 28 mph before I ran out of road. I probably could have done better if the dip wasn't right in the middle of the run, oh well. Electric motors produce a LOT of torque at low speeds. I knew this already but this really made me understand it. Even really BIG tiewraps can't handle this torque more than once or twice. If the motor is set to run at its rated current at a particular speed, everything below that speed is over it's rated current. Motors run over their rated current get very hot! While fun and informative, I'm not going to spend any time improving this setup. It has served it's purpose and I'm now going to devote my attention towards the next phase of this project.